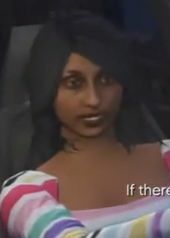 Saeeda Kadam is a character in the HD Universe who appears as a minor character in Grand Theft Auto V.
Saeeda Kadam is, in 2013, a resident of Los Santos who immigrated to the United States of America in 1993 with $50. The family, by 2013, run a successful tailoring company and supply a number of department stores, including Posonbys. He car is later stolen while at Los Santos International Airport, which is later retrieved by Franklin Clinton, Michael De Santa and Trevor Philips. She later e-mails the protagonist who retrieved her car and sends a free suit to their home. My name is Saeeda. I wanted to thank you again for chasing after that man who stole my car. I am extremely grateful. It's not the car that matters - I am insured after all - as much as the fact that you stopped to help a person in need. My family came to the USA 20 years ago with $50 to our name and thanks to a little hard work and a lot of ruthless business tactics, we now run a very successful tailoring business with supply contracts at many of the high-end department stores, including Ponsonbys. All too often these days, the American Dream is reserved not for those who love thy neighbor but for those who stab thy neighbor in the back, which leads me to believe that you're probably not a rich man. Plus I really need to get my karma back on track so, as a small token of my gratitude, I have sent one of our top-selling men's suits to your house. If it doesn't fit, remember it's the thought that counts. Saeeda's e-mail address is SaeedaKadam@eyefind.info. This page was last modified on 1 November 2013, at 14:39.